Montevina Winery unveiled a contemporary new package for its portfolio of wines with a clean, bold and bright label, modern logo, and a new luxury bottle. The Pinot Grigio, White Zinfandel and Chardonnay are now shipping. The Montevina line of wines also includes Cabernet Sauvignon, Merlot, Barbera and Zinfandel, all of which will convert to the new packaging over the next few months. Montevina Winery is located in the Sierra foothills and was founded by Cary Gott (father of renowned Napa-valley winemaker Joel Gott) in 1970. The first vintage of Montevina wines was released in 1973, and the winery quickly became well-known for its robust red wines, particularly the Zinfandel and Barbera varietals, which maintain those same regional characteristics today. The grapes for the Zinfandel, White Zinfandel and Barbera are sourced from 400 acres of Amador County estate vines, and the Cabernet Sauvignon, Merlot, Pinot Grigio and Chardonnay are sourced from premium vineyards in California selected for their true varietal character. 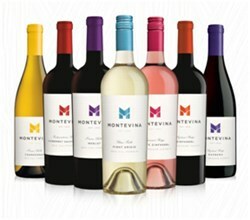 Montevina wines retail for $8.99. Click here to download bottle shots of the new package. Montevina Winery is wholly-owned by Trinchero Family Estates, Napa Valley vintners since 1948. The portfolio includes more than 30 brands such as Sutter Home, Ménage à Trois, Trinchero Napa Valley, Napa Cellars, Terra d’Oro, Seaglass, Trinity Oaks, Folie à Deux, and the number one alcohol-removed wine, Fre. TFE markets and sells Joel Gott Wines; Bandit, Newman’s Own, and The SHOW. TFE’s import portfolio includes Angove Wines from Australia; Doña Paula wines from Argentina; Carmen Wines from Chile; Shatter Wines from France; Sugar Island Caribbean Rums; and CRUZ and Tres Agaves Tequilas from Mexico. Visit http://www.tfewines.com to learn more.